I think it maybe time now to revisit Brexit and talk about the effects on the economy of the decision to leave the EU. First, the economy in general: in May the governor of the Bank of England warned that Brexit was likely “to have a negative impact in the short term” but now Bank of England has reported that no such impact could be detected. In particular although housing had experienced a dip it had proved more resilient that had been thought. Second, unemployment: a total of 1.65 million people are unemployed, a fall of 54,000 over the quarter and 201,000 down compared with a year ago and an eight-year low, while the 4.9 per cent jobless rate was lower than any time since 2005. 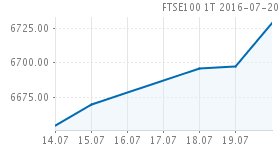 Third, publicly trading companies: the FTSE index of the UK’s top 100 companies soared to an 11 month high this week. There were plenty of good reasons for voting to leave the EU in the recent referendum. But there were predictions of an economic meltdown from those campaigning to remain in the EU, including the Bank of England's governor. These predictions were false, wrong and misleading. Thankfully, the British public had more sense and voted for Brexit. Thank you.